This is Naked Capitalism fundraising week. 624 donors have already invested in our efforts to shed light on the dark and seamy corners of finance. Join us and participate via our Tip Jar or another credit card portal, WePay in the right column, or read about why we’re doing this fundraiser and other ways to donate, such as by check, as well as our current goal, on our kickoff post. And read about our current target here. Lambert here. Most coverage of ObamaCare (ACA) policies available through the Exchanges, especially Democratic-friendly coverage, has focused on the price of policies, rather than their value. This post focuses on value, and shows why the distinction between “in-network” and “out-of-network” coverage is important. At least in the case tested here, insurance companies are shown to “narrow” their networks, and hence the coverage available to their policyholders, to exclude specialties like oncology, cardiology, internal medicine, and neurology. By Dromaius, who blogs at Corrente. Originally published at Corrente. As we venture into the world of narrow health care provider networks, I thought I would take some time to study what they really mean, in terms of how the new networks might affect patients’ access to specialty care services. To do this, I compared the current landscape of provider networks with those that will be available on the Exchanges. I used Washington State as a case study. Your mileage may vary, but you will very likely find similar information by querying insurance providers in your state, given that the narrow networks on the Exchange plans are a nationwide paradigm change. They are the only state-wide insurance provider offered on the Washington State Exchange. They are the only Blue Cross Affiliate on the Washington State Exchange. Thus they have the best search engine for accumulating this information and for finding direct comparisons between networks. I visited the Premera Find a Doctor site. For each doctor specialty listed in my graph below, I queried the site for “specialty name” (such as oncology) within 500 miles of 98109 (the Space Needle zip code). 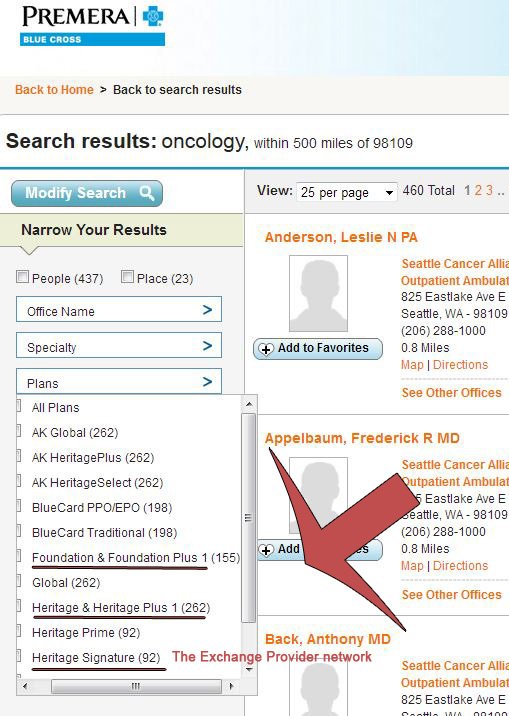 Theoretically, this broad search would give all of the doctors in Washington State. Here is a graph of my findings. Posted at the bottom of this page are general instructions on how to reproduce my data. I have proof-read my data but if you find any errors or discrepancies, please let me know immediately and I will update my graph, especially if you find errors that materially affect the trends seen in my graph. The blue bars represent the numbers of in-network doctors for each specialty in the Premera Blue Cross “Heritage” provider network, the network that Premera historically felt compelled to support for its subscribers. 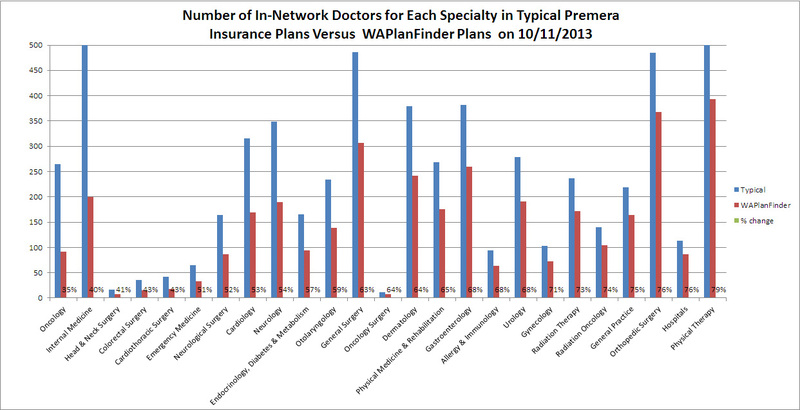 The red bars represent the numbers of in-network doctors on the Premera WAPlanFinder Exchange plans’ provider network, called “Heritage Signature“. I’ve sorted my data from left to right according to which doctor specialty has the LOWEST representation on Exchange plans. [Update] I updated my graph today and have seen a slight drift toward more providers in the Exchange network. The change was very small and did not materially affect the trend I’m seeing, which matches the national trends. I have archived my previous chart here. I will revisit my data every week or two and will keep archives of all charts. As you can see from my results, the most under-represented specialties (on the left) are the ones that typically provide services to truly sick patients, such as oncology, cardiology, internal medicine, neurology. And no doctor specialty has more than about 75% representation on the Exchange provider networks. Hospitals are also included on the right of the graph. Their numbers are diminished in the Premera Exchange plan network via excluding specialty hospitals that are crucial to good care in this region, such as Children’s Hospital and the Seattle Cancer Care Alliance. What we’re seeing has been described as a quasi-Medicaid level of doctor access. I would have little problem with plans that “streamline care”. But using Premera as a case in point along with reading about left-out doctors and hospitals all over the nation, I see a pattern of drastically reducing access to care for the sickest patients. This is a method for insurers to subvert the mandated yearly patient out of pocket maximums, (as well as the loss of insurers’ ability to cap lifetime maximum payouts) by making access to expensive care difficult or impractical, especially for the poorest and sickest patients. And by limiting tax subsidies to Exchange plans only, I believe the Democrats wrote their law deliberately to let insurers do this. [Update] I see that Paul Krugman praises the Medicaid Model for its “willing[ness] to say no,” a trait that allows Medicaid to control costs better than any medical care institution in this country. I just want to say that I know all about that. When I was a teenager, my mother was hospitalized on Medicaid for acute clinical depression. She was discharged from the hospital during a time when her counselor was on vacation, and while she wasn’t ready. Apparently Medicaid had said no to more hospitalization. My mother committed suicide 3 days later. My personal experience is that when Medicaid says no, people die. Is this the level of care we want for the whole country? Come on, progressives! Is your party so important to you that you don’t care anymore about the principles that led you to join it? Don’t you think you need to fight this? Maybe you should do so for the sake of your party? I would love to spend 24-hours-a-day, 7 days a week in action on this myself. However, besides the fact that I feel powerless, I’m finding that the Exchange plans create in me an urgent need to leave self-employment and venture back into the world of employer provided health insurance. So those of you with a national audience, maybe those of you who have insurance yourself, how about stepping up! In the next dialog box, choose ‘All’ in the first pulldown, ‘Bluecard PPO’ in the second pull-down. Click search. Pull down the “Plans” list. It gives the provider networks. You’ll see a dialog that looks like this. Heritage Signature is for the Exchange plans, and is the network used for my red bars. As for Foundations and Foundations Plus, it is the network that seems to have been traditionally used for the “slumming” plans. The other networks are either in Alaska or are part of the Blue Cross nation-wide network. They don’t apply particularly to Washington. If you need more details about this, message me and I’ll send them to you. Here is a screen capture of the best of the Premera Exchange plans. Looking at the table headings on the right, you will see that “Exchange Signature” is the provider network. This entry was posted in Guest Post, Health care on October 12, 2013 by Lambert Strether. You said you were thinking of leaving self employment and delving into the world of employer provided health plans. Is that an artifact of where you supposedly live, Washington State? Here in the Deep South, employers are dropping company plans like hot bricks. Also, our benighted region is the focus of the “No More Medicaid” movement. Let them eat grits seems to be the prevailing attitude. In the race to the bottom, we’re number one! My parents, who own a small business, found out that their existing low-deductible group health insurance plan is being discontinued. Their agent explained that insurance companies are making major changes, to basically align all of their insurance plans with what they offer on the exchanges. The new group plans being offered to small businesses will have high deductibles and severely restricted networks. For my own high-deductible health insurance plan, which I have had for a decade, I got notice that it has been discontinued, and while I will be able to renew next year, I should expect steep increases in price if I choose to stick with it instead of moving over to the exchanges. I’ve been surprised at how trendy restricting networks has become. My wife’s employer plan is cutting out the ‘high cost’ hospitals in the area. They are NOT a small business. Oh, and they raised premiums, too! I shudder to see what my employer will offer. There’s been a huge race to the bottom in employer provided plans over the last 5-10 years, it seems. Oh, and per ambrit’s comment, My wife and I are NOT down south. So, employer-provided races to the bottom have gone nation-wide! A reminder and a question. I believe the physicians participating in the ‘heritage’ program already represent a select group, i.e., these are BCBS approved among a larger cohort. What is the probability that the percentages change significantly over time? If Dromaius is right about Obuggercare being a quasi-Medicaid model, are specialists simply downing tools and refusing to participate in exchange plans that offer lower reimbursement (i.e., at cost or below cost) compared to traditional employer-provided coverage? Due to the murky (read: illegal) pricing of the health care cartel, good data is hard to come by. But we’ve all heard the stories of how the ‘rack rate’ for walk-ins gets discounted for traditional health plans, and is slashed even deeper for Medicaid. Only politicians could regard this a model for anything but national decline. The ‘American century’ ended 13 years ago, folks. Seems like a long time ago, don’t it? Zeroing in on oncology (which I know a bit more about), the shortage of oncologists is a very serious issue, at a time when the treatment of cancer is on the brink of major breakthroughs. The need for new oncologists who are closer to medical school and more up to date on how cancer can be controlled and even cured is dire. The argument in much of the medical discipline is that the problem is regulation, period. If oncologists (who to be frank suffer great stress and repeated trauma from working with such sick patients) cannot be sufficiently rewarded, their numbers will shrink. I would like to know your perspective on the need to control medical costs, vs. the need to encourage more people to become doctors. I think there are plenty of people who would be interested in becoming doctors and I’m familiar with the current system of selection, education and training for that field. If that system were to be opened up and publically supported as a commons we would not suffer any shortage of practitioners. For example, think of all the people who would be interested in training to be a doctor later in life – a late discovered passion even. Today the opportunity to follow through with that is almost non-existent. exactly! I was watching something a while back about the difficulties with rural areas obtaining doctors, and some of them even started subsidizing the education in exchange for a set number of years contract following. granted, it’s indenture. but if we subsidized that quarter-mil education and got doctors giving service to the public for reasonable cost, and no sacrifice in skill levels, why not? Millionaire Paul Krugman praises Medicaid for refusing to pay for “low-payoff medical procedures”. If Millionaire Paul Krugman ever needs one of those low-payoff medical procedures, will he refuse it? Or does he think low-payoff medical procedures should only be available to millionaire elites, such as himself? Also, how does Millionaire Paul Krugman come by his knowledge that trouble finding doctors who accept Medicaid is a “greatly exaggerated issue”? Apparently, millionaire economists don’t need to cite research or link to references. All human developed systems suffer from “childhood” problems. The initial operational stage of such systems suffers from aches and pains. Problems at that stage shouldn’t be ignored, but if well attended to, many of these problems disappear. ACA suffers from inherent problems, e.g. private insurance, but many growing up problems. My approach would be to point to problems and watch whether they are resolved. It’s only the very beginning. Furthermore, with some luck, the next Democratic president in 2016 is guaranteed to be more capable and more enthusiastic about our health care system. “maybe the next democratic president”…Seriously? I think there is something to be said for your POV. And since it is here and is law today (assuming we still have laws) it is best to work with what we have. But we need to understand that the ACA is an irrational and corrupt bill that was passed only because the medical industry gave into public pressure to solve some of the surface problems like pre-existing conditions that were devastating millions of people. Some very minimal and basic care may be better than no care though I don’t know. Given how the administration already reacts to criticism of the ACA, how likely is that? You can’t improve the system if you do not first recognize the problems and start considering solutions. Democrats are often quick to admit that the plan is “flawed” or that it’s “not perfect,” but then refuse to even discuses what these flaws are. If you admit that it’s flawed, you would expect them to be able to at least list those flaws when pressed. Instead we get this emotional black male about how we want to prevent people from getting healthcare. Our critique of the ACA is not based on the fact that it’s flawed. Any proposal is going to have issues, especially one as complicated as this. Nor are we claiming that it will help no one, it’s rather clear that ACA will benefit those in conservative districts that had few regulations to begin with. Our issues with ACA are specific and can be quantified. They are genuine problems that will prevent the ACA from delivering on its promises. But the Democrats refuse to debate the issue. In fact, the only real debate they are willing to entertain – comes from the Tea Party. Real life small d democrats despise all elected officials because they passed this POS while beholden to the medical and financial industries. Wasting time talking to or about big D or big R critters or their troll spawn is not healthy. “Q: You advocate broadening Medicare; how would you pay for it? Seriously reducing total costs and increasing coverage is easy here in the U.S. There was never a need to “invent” a new health-care system. The world is filled with good to mediocre systems. As an IT guy how would I design a system? I think I would look and see if that problem had been solved before. Why this obvious solution was missed by all parts of the political spectrum including even many opponents of the ACA who were on the left. All we had to do, during the debate, is insist that we look at this as “systems” problem like any other problem technicians work out. That would have been the radical solution and that should have been the discussion. The ACA is wrong because it is irrational–just because it is slightly less irrational than the current system. The point here should be simple and progressives including opponents did not frame the issue very well. This is not about just health-care it is also about rationality, science and compassion which should be the main and only slogan on the left. You’ve hit the nail on the head, admittedly inadvertently…”Progressives” think that the system is broken and needs to be fixed. Radicals understand that the system works as designed, and, if changes wish to be made, it needs to be forcefully scrapped. Can you elaborate on “forceful”? To me the opportunity was to oppose it when it passed and now it’s too late. The other alternative is to support the RP in its efforts to stop the implementation of ACA. Any ideas? Progressives bought a lipsticked pig in the poke (“we’ll have to pass the bill to see what’s in it”) and now cannot back out. They passed it. They funded it. They own it. They will now spend forever defending the indefensible. The reason for debate in legislatures is to hash out weaknesses in bills to avoid hidden tragedy arising from intemperate confidence of partisans in works authored by their supreme ignorance. It’s an adversarial process which progressives alone chose to short-circuit in hot pursuit of unrealistic ideological dreams. Legislate in haste; repent in leisure. Progressives fought for single payer. All career “progressives” cared about was running interference for Obama, and the public option bait and switch operation to make sure single payer never got on the table. Of course that was the obvious solution, and the point I’ve been making for years, even decades. The response was invariably along the lines of wanting to avoid the evils of socialized medicine…… whether the political stigma of being ‘socialism’ or the perception of rationing, long waits, and inferior quality in other countries. The AMA and hospitals had strong opposition for obvious reasons, the fear of reduced compensation. Especially on a local level, healthcare is a powerful voice, generally being the largest employers. This is a sector that represents 18% GDP, or over $3T annually. Money talks. Single payer is a fantasy as long as Congress is bought and paid for. Obamacare can be vastly improved though, and needs to be. There are still ways that care can be improved while bringing down costs. Even options for the exchanges that would eliminate third party insurers, similar to Kaiser HMO’s in California (which the couple people I know who have been members really liked). Privatizing Medicaid has been a failure (long post in itself) and needs to be fought. How does Colombia— an economy just emerging from decades of violencia and drug cartel infighting— manage to have an entirely privatized health care system that ranks far above the US at a fraction the cost? How does Cuba, an economy where per-capita incomes are only about 10% of the US, manage to train and support far more doctors per capita than the US? Or France provide superior health care at about half the US cost, with no uninsured left to rot in the ditches? You are bit off with France they spend about fifty-percent less not half but they have the best system in the world. But the point here is that this HC system is run by criminally-minded people and institutions who believe health-care and the suffering of human beings is yet another source of profit for the people on top of the pyramid. The tragedy is that nearly all Americans have no clue about the real situation with health-care and how little accurate information they are getting from both political parties and the propaganda organs. Why does the $700B in cuts need to be fixed? It isn’t a cut to beneficiaries but to providers. The providers agreed to the cuts as a consequence of an expectation of increased revenues due to drop in numbers of those uninsured that care must be provided for. Though with some states refusing the Medicaid expansion thus increasing the coverage gap the providers are rethinking this agreement. Allowing bargaining on pharmaceuticals for part D would be big savings…. which is why big Pharma is fighting it so vigorously. Medicaid and the VA already do this, IIRC. And shout out to Lambert, did you catch the news last week that Maine passed legislation allowing residents to import drugs from foreign countries? It’s the first state to make it legal, though many do it and enforcement has been lax. Still, expect a fight from Pharma to shut the practice down in Maine and lots of propaganda about safety issues. The reality is that many US drugs are being manufactured in Asia today with FDA approval. Drugs still under patent are being marked up to infinity and patents are extended by payments to generic companies to delay entry to the market for several years (though SCOTUS ruled this summer that the practice could be exposed to anti-trust scrutiny). Thank you for your research. I wish I could say I’m surprised, but alas, no. As long as there is profit in healthcare people will not get the coverage they need. This makes a strong case for a single payer system. I spend a lot of time trying to tell friends that are ACA advocates that Insurance does not equal health care. My greatest fear in all this is that we end up with a lot of people who have little or no money to spare (and I believe that easily describes at least 60% of the American population) spending money on insurance and receiving little or no actual health care along with that. As someone who has struggled with unemployment over the last few years, I tell them that even though I have decent insurance through my union I have to seriously consider if I can make do without care because to go to the doctor will mean a co-pay. And I’m one of the lucky ones. IOW, the high co-pays and deductibles already limit health care for many Americans, but of course that won’t be enough for the Insurance companies. I knew there had to be other ways they would limit care. Inability to get to a doctor is good. How could they be blamed for that. My company has 12 people. We have 4 Horizon plans available, of which I can afford only the high-deductible. I pick up the first $5,000 in anyone year, but at least I get billed at Horizon’s rate, so I’ll never pass the $5K, and I get prescriptions at their rate. Since all three people in my family have chronic medical conditions and routine prescriptions I’m probably spending about $6,000 a year, including the premiums. Mind you, this is without anybody going to the ER, having an MRI (which I need but can’t shell out $1,500 for) or getting anything but routine care. Should I ever hit the $5K in charges, though, I’m off the hook entirely. Around October 1 this year the owner, who manages benefits, said in passing that while we’ll leave everything as is this year (with an 18% hike), next year we would look at other options. So in English, we’re going into the exchanges. Yesterday he repeated himself, and when I said but it’s so expensive, he said yeah, well, from what he’d seen the premiums looked pretty good. Having just fortified myself with this post, which I’d read at Corrente while eating lunch, I asked him if he’d checked out what the actual benefits were. He said oh, they’re standard. I said, well, what about providers? Are the networks the same? Can you get to an oncologist? He looked surprised to hear that exchange plan networks were going to be just a little, uh, more narrow than traditional ones. I’m sure he’ll still toss us on the exchanges next year. Why should he worry? When he blew out the candles on his birthday cake this year at the office party, he gleefully showed off his best present ever: his Medicare card. Lambert, after having been poisoned by over treatment I find myself liking this system because it does exactly what you are saying it does. It limits access to specialists in neurology, cardiology and oncology. These are the three most egregious medical specialties in my opinion as far as patient harm goes and only treating symptoms. In my case I went to a neurologist and without even knowing what was making me sick he wanted to inject my neck with Botox (the muscle had become so tight in my neck it was causing massive headaches on my right side). And neurologists have the least answers of any medical specialty as to what is causing disease. Oncology is almost as bad (see the Cut, Poison, Burn documentary film). Seriously neurologists don’t know what causes MS, scleroderma, autism, FM, CFIDS, Alzheimer’s, ALS and many, many more diseases that are primarily caused by environmental toxins. In my case I have developed five diseases from gadolinium based contrasting agents (GBCAs). Two are because gadolinium, a toxic metal, I was injected with 12 times, with two of the least stable of the GBCAs, infiltrated my hypothalamus. But we must not talk about how our medical industrial complex is poisoning us now should we? That’s not politically correct. We should only talk about limiting care even if that is by and large a better outcome. I remember how this idea came to me. If I had not jumped through the hoops my insurance company put me through to get MRIs with gadolinium based contrasting agents, I would not be sick today. They cause a new man-made disease called nephrogenic systemic fibrosis but the name of the disease should be gadolinium-induced systemic fibrosis. Now you must be asking what was wrong with you to have so many MRIs. That must be the cause and not the GBCAs. Well the reason is I am high risk, like Angelina Jolie, for breast cancer and carry a BRCA mutation. And I allowed myself to be fear mongered into getting these exams I didn’t need (thermography and diagnosis by proteomics are much better choices in my opinion). Of course the only way I will get well, if it is even possible, is through chelation. Of course the medical industrial complex has a problem with that because chelation cures. And this is why cardiology is a joke too. http://www.forbes.com/sites/harlankrumholz/2013/03/27/chelation-therapy-what-to-do-with-inconvenient-evidence/. In the article regarding the chelation study, the therapy showed a significant improvement over the control group (all in the study had heart problems) in heart events of all kinds. But they don’t even mention why it might work. Perhaps getting heavy toxic metals out of your system is actually a good thing for your heart too. The ACA in many ways is exactly what we need. I’m tired of science being suppressed to enhance the profits of pharmaceutical companies aren’t you? Agreed, however, you then go on to self-diagnose, “I am high risk, like Angelina Jolie, for breast cancer and carry a BRCA mutation,” and become a patsy for the medical-industrial complex and its’ attendent over-testing and payments. I agree. I tested after my sister was diagnosed at 34 with stage 2 breast cancer and had a 1 1/2 centimeter sized lump in her lymph node. Her insurance company paid the entire amount for genetic testing to Myriad Genetics of approximately $3,000 at the time. Like a fool I was tested too but I knew where to look for the mutation so my insurance company only paid about a tenth of that. Still I am going to be retested because it has caused me enough grief and I don’t have cancer and believe they may have made a mistake. They too were/are a predatory company seeking to capitalize on the BRCA testing by sending form letters you can mail to your family members about the mutation. As they say genetics loads the gun and environment pulls the trigger. Did I have a healthier lifestyle than my sister? Absolutely not; she is a health nut. But she took high dose estrogen birth control pills and I did not. We both believe that caused her cancer. the second said “any doctor you go to will recommend fusion (of multiple disks in the cerivical region) but these will not solve your symptoms and will make your life worse.” this is true, but they still have no clue why the neck injury is causing the head stuff. and they don’t seem very curious about finding out, either. I’m in pain 24/7, some days are better than others but I swear by light therapy and my neck issues resolved with the help of this therapy. If someone tried to take my infrared light I would break their arm. Not really, but no one gets in between me and my light therapy. thank you for that tip. i’ll have to do some research on that to see if it would be useful for him. @anon y’mouse… what was the event that caused the injury. From my own experience its all about the C – section of the spine (so much blood stuff comes out there) and diffuse axonal forces Intracranial (DIA). There need not be any viable signs of tissue or cellular damage as the imaging tools still don’t have enough res to view detail down to the atomic level. For exsample, there was some work on algos for MRIs that would allow the observation of sweating water by neural pathways, an indicator of injury, but, has not been approved as yet. The hole thing is insurance driven and complicated by the legal aspect, hard evidence, been there done that. 4 to 6 years is the timeline to discovery, where one will probably recover too. Skippy… hell it took me 4 doctors till I got a proper examination, after my injury, and that was only the beginning of the fun. bloody stuff–in more ways than one! are you -as good as you’ll ever be-, yet? ins. co’s and doctors and bears, oh my! wow, massive help around here! he was in a rear-end collision 2 years ago, at about 45-50MPH but was in a large work truck. since the truck didn’t “move” with the impact, he and his head/neck did. typical whiplash. 3 herniated disks, a cyst, mystery “fluid inflammation” still at the site, cervical region moves totally out of correct alignment now (in blocks rather than smoothly), and probably significant ligament damage which they keep saying doesn’t show up well on the scans he’s had. this causes severe vertigo (swaying around while standing still. footing choice must be very cautious, even in familiar environments), tinnitus, head & neck pains & very limited range of motion for his head. at one point he even had blurred vision that required special glasses, and the doctors still had NO CLUE! my theory has been that he has spinal fluid imbalance somewhere between the head and lower spinal column. he has nearly ALL the symptoms of Chiari I disorder, but they say that isn’t showing in his scans. only diagnosis he’s had has been “cervical instability” & herniated disks. i’m thinking = syringomyelia & arachnoiditis, plus the possible fluid pressure imbalance. i don’t mention his/my issues merely to get attention (like the stereotypical “doctor at the dinner party” problem who gets no rest), but am grateful to all who share ideas. Well theres obvious traumatic injury to the c-section which will cause all kinds of havoc and is slow healing to boot, hence the 4 – 6 years which an eye to possible re injury ie falling down et al. The hard part is the brain as damage can’t always be tested for unless its gross and then you have major problems. Still you can get distorted reality, emotional difficulty’s, sensory dramas which via feed back loops can really piss you off, not the same person feeling. Sadly patience and compassion are not what the system delivers, which compounds the suffers dilemma. Skippy… not recommending here but some psychological drugs have been shown to improve physical and neurological symptoms. It an avenue to be explored, till the healing process is further down the road. I took Tri’s for a bit, until the worse effects diminished and then there’s teh breathing therapy that has been mentioned here in comments. PS. your not alone by a long shot. the Tri=tripe reuptake inhibitors, correct? did you ever attempt biofeedback? i hope you are feeling substantially better, now. this stuff is no joke. even worse, one may look like nothing is wrong with them, causing a lot of disbelief from pretty much everyone you encounter (even health professionals!). Uptake inhibitors yep, only for a couple of months tho. Got off them as soon as I could. No bio as I have my own personal methods from back in the days, military survival – deep free diving tools thing. Its been almost 6 years now so this is the new norm most likely, still I always looked at it as a new challenge and something to be embraced rather than lamented. Their were parts of the old me I didn’t like so much and was a good opportunity to modify those aspects. The stay at home dad is the best part and watching the wife be able to fully commit to her passion for medicine was worth it in the end. skippy… new horizons are something I always look forward to… what ever it might bring. very grateful for those tips. at least you have reached your state of acceptance of this thing. I think he’s reaching the end of fight/struggle against it mode. would that more of us could support stay-at-home husbands. kids need someone around more often than not. even if just in the other room somewhere. “feels like home” stuff. also, very sorry about your pain. there is probably nothing worse than chronic pain. perhaps chronic fatigue, which can be caused by pain. hopefully you do not have that kind of double-whammy. Oh yes I do. I was first given all the catch all diagnoses like FM and CFIDS and told it was in my head. The diagnoses were all wrong but then the catch all names became real diagnoses, proven through labs and biopsies: adrenal insufficiency, Hashimoto’s disease, lichen sclerosis, dry eye syndrome and a differential of scleroderma which is consistent with gadolinium-induced systemic fibrosis. Everything in your body turns hard. Lovely product, Omniscan and it’s the cheapest on the market and GE is still pushing it onto unsuspecting patients. I hope for your partner’s sake he/she doesn’t have gadolinium toxicity like I know he/she must due to more than a few MRIs with gadolinium based contrasting agents. Keep in mind that gadolinium gravitates to damaged tissue. I know for a fact this is true. Want to know how I realized what was making me sick, which was important to me? The reporter that did the series on Omniscan, GE gadolinium based contrasting agent, and the one I had 11 times, kept emailing me back. I had contacted him and said I was sick from something else but I didn’t get the MRIs anymore because I was too sick. I told him I liked his reporting and could he do a story on the suppression of proteomics as a diagnostic tool. In the same email I told him I was worried about being able to drive for much longer because my legs were so weak. But he kept writing me back and writing so I told him I was going in for an EMG and I was going to check to see which gadolinium based contrasting agent I had. It was Omniscan, 11 times. I was in shock for about a week and couldn’t even write him back. You know I had vertigo after flying with my husband in our little Cessna. He was doing dips and we were having a good day till I got off the plane. I couldn’t get my equilibrium back for two weeks. They tried everything, steroids, antihistamine and finally MRI and another injection of Omniscan. Shortly thereafter I was exercising and injured my neck. It was bulging, stiff and hard which by the way is a sign of gadolinium in your tissue. Now my legs feel like sticks and my skin is tight. Your partner was lucky to see the second doctor she saw. Many surgeons WOULD have recommended surgery. It happens, a lot, and people do what the good doctor says. Then they’re unhappy when not only do their original symptoms not improve, they have new ones. Whiplash is one of those type injuries there don’t seem to be many answers for, if I recall correctly, and the effects can be underestimated. It also gets looked at askance as it is a common fraudulent claim used as abnormal objective findings aren’t required. Hopefully the symptoms WILL dissipate with more time. I’m assuming no use of aspirin or nsaids contributing to his tinnitus. This seems pretty obvious to me but I’ve discovered needs to be shared. My sister, 62, was diagnosed with colitis a few months ago by a gastroenterologist she had been seeing. She’d had all the standard tests done and had episodes of grossly bloody stools. Colitis was diagnosed based on ruling out the worse possibilities. So, for several months she had intermittent bouts. I thought it odd that colitis would develop at such a late age, but who am I to question a GE? About a month ago, at a followup visit, my sister casually mentions the Aleve she’s been taking for her arthritis (and she’s super smart, normally, I swear). It turns out her bleeding is NSAID related, she’d never been asked out its use. AFAIC, that’s on par with malpractice but demonstrates the need to be your own advocate. People want to run to specialists thinking they will get better care. There’s saying in medicine, if you hear hoofbeats, think horses not zebras. I suspect the specialist thought a GP had already ruled this out when in reality, the GP had been bypassed. A GP routinely asks about OTC drug use. A specialist does lots of tests. They couldn’t earn twice the income of a GP if all they did was to tell their patients to switch from Aleve to Tylenol. Ducking for cover now from any specialist MD’s. Yes there are those who are honest and ethical. Still I’ve heard many admit there is truth to what I wrote, sometimes intentionally to stuff revenues, more often because when one is a carpenter everything looks like a nail. thank you for both of your posts. i sincerely wish that anyone who is having a medical issue gets much more assistance than he has in this one. he takes no aspirin or other painkillers. he has and does take occasionally Gapapentin, but he is not & has never been a “let me pop this pill and i’ll feel better” type. more like a –only with crippling pain will i take Bayer– kind. NO KIDDING! well, vertigo and tinnitus are technically in your head. but they are not psychosomatic. naturally, he didn’t find that perspective amusing. I once had an ER doctor tell me my migraine wasn’t life threatening, in the midst of said migraine. Understand I don’t step foot in a hospital as a patient unless I think I’m dying (or in this case, wish I were). I told him not to bet on it, though I wasn’t sure if it was his or my life that I wanted to threaten. Shortly after I threw up on his shoes. I wonder if he stopped and paused the next time he was tempted to say a migraine wasn’t life threatening. yeah, that part was highly suspect to me. if they mean: cut off the current medical-industrial complex and its overfocus on finding new drugs to sell you so that your problem is never cured, rather than focus on preventation and other therapies that will help you cope better (but don’t make pharma BANK), then I might agree. people that I’ve known with terminal cancers continue to get treatment that really narrows their quality of life, on the advice of their doctors who say that it will slow down progress of the disease and make it less devastating. these both might be true, but in the experiences I’ve witnessed, it sometimes seems that they are simply torturing someone who is dying because it continues to make them a lot of money, and in both of these cases eventually Medicaid was paying for it. that’s really unfortunate. how to tease those two apart, I don’t know. Bingo. That is exactly what I meant and it is something I think about as well because insurance companies are the curse of the earth about denying valid claims. But I’m a former auditor and financial forecasting type and I see what good controls will do. The insurance companies are going to be good controls for awhile and maybe even a NY minute but the alternative (single payer or Medicare for all) was not an efficient means to provide healthcare. This is true for several reasons but my main concern is the predatory pharmaceutical companies and medical device and medical equipment manufacturers that own the CDC, the FDA and the NIH. I have a problem with that for many reasons and one of them is the vaccine schedule. We are up to 69 vaccines I believe and still we don’t know what causes autism. Autism is going to cost society trillions of dollars and we don’t know how to treat it either. Well psychiatrists have a plan. More psychotropic drugs that’s all these autistic kids need right? the problem is alignment of incentives, though. the healthcare company has an incentive to get the most money and pay the least out in care, thus the denials and so on. the medical “professionals” have an incentive to get the most money out of treatment that they can. this is countered by the knowledge that the ins. co/patient can or will only afford so much. under the current system, as an outsider (and thus know-nothing) they both have an incentive to rob the patient, just in slightly different ways and one is at times beholden to the other for how much they can do so. if those two can work out an amenable way to agree on how much the patient will get robbed (plus the pharma & treatment & equipment &…. corps), then it’s a matter of pushing around the percentages and the patient is still getting robbed. plus their health is almost a side-issue here in all of this. ins. co’s are nominally on the side of “health practices” which would prevent them needing to fork over, while doctors et al. are on the side of increasing “treatments” to get more dough. i think Yves has put up on this site various articles which show doctors/hospitals defrauding Medicaid in this way. but—this is only going to get WORSE under the ACA. the subsidy chain that you are speaking of as being abused under Medicaid will simply grow to include the insurance industry. Why do you believe that single payer is not an “efficient” way to deliver care? All you have to do is look at how the cost curves for Canada and this country diverge after Canada adopted single payer in the mid-70s. Lambert, my concern with single payer is that it will give the government control over the payment of claims and they will in turn allow the pharmaceutical companies and medical device and equipment manufacturers’ permission to profit whilst poisoning us with impunity. There are so many lies in healthcare now that the status quo was bad enough. Give them more control over the government and we’ll have unnecessary treatments, scans and drugs that maim and kill on the market because it makes them money. That is my point. To use an analogy, look at what has happened with the too big to fail and jail banks. Our wonderful politicians repealed Glass-Steagall and incentivized Fannie and Freddie to buy garbage loans; loans that could be dumped on the taxpayers while they paid themselves excessive bonuses at our expense. I think what bothers me the most is that no one is considering the medical industrial complex as being corrupt. Whenever anyone talks about the healthcare problem or the ACA somehow they completely disregard the enormous cost of corruption in medicine. That bothers me and tells me that the pharmaceutical companies are directing the conversation not those on the right side of the issue. We need to have a serious conversation about this. With all due respect, you’ve lost the plot. Health insurance and big Pharma stocks went up when the ACA passed. Doctors already hand out drugs like candy with the system we have now. Evidence-based medicine, which is what people would like to see under single payer, would limit doctors doing low efficacy procedures and treatments which is basically the way they profit from patient ignorance. The worst is most are sincere but misguided (but don’t get me started on orthopedists, most of them are way way too keen to operate…). Read Maggie Mahar’s Money Driven Medicine. I have read her blog and I first became interested in her work when I agreed with something she said. She opined that the family of a terminally ill child, that was calling out for community help to pressure their insurance company to pay for their daughter’s experimental treatment lacked efficacy. She sympathized with the family and child but the treatment was expensive and likely wouldn’t save their daughter. It certainly is tragic for the family and child but this is how Big Pharma opportunistically takes advantage of cancer and other illnesses to profit. I’ve stopped all donations to the cancer industrial complex and Dr. Burzynski’s treatment is the closest we’ve come to curing cancer. Big Pharma, the Texas Medical Board and the FDA have tried for 22 years to put him out of business knowing that if there is a cure for cancer their revenue for profitable but toxic chemotherapy drugs will plummet. Their toxic chemotherapy drugs are Big Pharma’s cash cow and as long as they can milk that cow for more profits they will use their influence to suppress any science that shows promise. As an example I was in the original study for a diagnostic test for ovarian cancer using new technology called proteomics, the study of protein patterns in the blood. The diagnostic test was available in 2002, the same year I learned that I had the BRCA mutation. But the company that patented the test and worked with the NIH to bring it to market was aborted because doctors at the NIH left to compete with the company using the same technology to patent drugs to treat cancer tumors. Then the FDA steps in to regulate a lab test by defining it as a medical device. Ovacheck was highly accurate, non-invasive and a lot cheaper than screening scans, diagnostic biopsies and because it would detect cancer early chemotherapy drugs. It promised to change the world of diagnostics as the technology could be used for detecting any disease. The company went out of business and sold that test to another company that now has Ova1 on the market. But get this, it is only indicated for women diagnosed with a mass on their ovary and with ultrasound it is 96% accurate in detecting ovarian cancer. This was the first year I could get the test but most women don’t even know it exists. The company that went out of business had another test ready to market for colon cancer. Colonoscopies cost on average about $3,000 and these tests go for about $600. So you tell me is there Railroading Economics at work? How about predatory testing? Not sure about why their stocks are up. I will say that I was in telemarketing and about 10 years ago we were doing long range planning. They believed that customers were going to buy two or three land lines, one for their telephone, one for their fax and one for the internet. They built it into their plans and it didn’t work out for them very well because many customers gave up their land lines completely and purchased cell phones. The rest is history. It flattened the industry. This flattening of an industry is “Next” in healthcare. I believe you misunderstood, at least my position. I wasn’t advocating limiting access to specialists, there are times when they are surely appropriate. I was only pointing out that they tend to be overused. In our country there is a mindset that more care is better, and the more specialized the doctor the better. And that is NOT always true. The forest can get missed by focusing on the trees. Americans also insist on immediate treatment using the entire realm available whereas other countries often have wait times for more specialized non-critical care. And yes this CAN be better as expensive care is not provided for conditions that resolve spontaneously without treatment. This is one of the consequences of third parties obscuring costs to consumers and perverse incentives for providers. When a local orthopedic surgeon noticed in the navy that the 10 week wait for a certain knee surgery resulted in most refusing surgery due to recovery, his takeaway was to not wait to do surgery (get a second opinion before non-emergency surgeries! always! and insider recommendations can be invaluable, e.g anesthesiologists, surgical or orthopedic nurses, physical therapists, etc.). The future of medicine, IMHO, will be increasingly provided by general practitioners who will have a primary or preventative focus. There will be more of an education component as well and more auxiliary providers will be brought into the picture, such as dieticians and physical therapists. Nurse practitioners and physician assistants will be used more as primary care providers. In some states, pharmacists are being given diagnostic and prescribing privileges for common ambulatory complaints. This will help will relieve the primary care physician shortage as well as increase patient satisfaction (non-physician providers are reported by patients to spend more time and to be more comprehensive). It also has the potential to significantly reduce costs. If I’m not mistaken, they are billed at the same rate as physicians and the cost differential is retained as profits. There is also the beginning of a movement towards models that compensate outcomes (flat per capita rate with or without intermediary insurer) rather than fee-for-service. Modern medicine is lousy at treating anything subclinical. But go outside medicine, and a ton of the people are really sincere but they are the functional equivalent of quacks. And I say that as someone who has gotten some benefit from alternative treatments. Look at Steve Jobs. He refused to go the conventional medical route for a highly treatable form of cancer and wound up dead because he waited too long to go the conventional route and tried alternative methods. A guy with all the money in the world could not find an alternative treatment for cancer in time to save him. I’m not saying that there aren’t treatments that might work, but if a guy like Jobs can’t find them, who is motivated, connected, can pay for anything he wants and has been using alternative approaches for a long time, how can you? As for auto-immune diseases, they are likely not caused by toxins but a pathogen. There is an experimental medical treatment which has a high success rate. They can’t enough $ fund research to do large scale trials because the drug that works is tetracycline, which is an old, cheap, not pernicious antibiotic that is off patent. There is no $ for research on off-patent drugs. Arthritis. I have my own anecdotal result. This acknowledges that there are may etiologies for “arthritis”, but the following has shown clear efficacy for me, and my wife, of different races. Chondroitin, shark cartilage, and glucosamine. Aaaaaaaaaaaand, the realization/acknowledgement that cartilage is …… avascular. The significance of ….. avascular, is that the regeneration/reconstitution of cartilaginous tissue needs time, because there is no capillary blood borne nutrient transport in cartilagious tissue, and the active transport mechanism is “diffusion”, which takes time. With regular supplementation (~ 1g/day, double early on) using the over the counter nutrient cited above, both my wife and I have reversed what appeared to be progressively worsening conditions in the knees, back, arm joints, and wrist/fingers. We were becomming essentiall mobility limited because of prgressed stiffening and pain. After initiation of the nutrient therapy regimen, and after a few months, the symptoms/conditions went away for both of us and remain away 10 years after we started the regimen. I have a deep resistance to commercial health care, having “cured” myself all my life using unsanctioned remedies applied where reasonable. Not without failures, but with the internet as an information resource, much failure has been removed. Oh, and for such as purported back/spinal disc degeneration, research the structure of the spinal disc, and research the protien compostion of collagen and satisfy yourself about what the potential options are. Oh, and for such as, specifically the onset of, near-sigtht vision degeneration, research the protein composition of the eye lens, after the same fashion. Please read the link. The book is not for regular arthritis, but rheumatoid arthritis, which is typically classified as an auto-immune disease but there is good reason to think auto-immune diseases are actually caused by a pathogen. After doing a great deal of research, it seems like autoimmune diseases are caused by a combination of “slightly overzealous” immune system reactions and an “irritant” or “trigger”. The “trigger” may be a bacterium, a virus, or an allergen, or even an injury. The “slightly overzealous” immune system reaction may be due to any number of genetic oddities or something else. In short, all autoimmune arthritis is a form of reactive arthritis, with a slightly overactive immune system causing it to go on longer than “classical” reactive arthritis; or in many cases, a persistent trigger causing it to continue. The doctors really don’t know enough about the immune system to prescribe anything except random poisons for autoimmune diseases. The immune system studies related to AIDS have helped some but it’s still, fundamentally, not understood. I have a friend that also has a bad case of gadolinium toxicity. We have both spent years doing research but she has a biology background and I do not. She opines that she has to get metal out of her because she can’t treat her Lyme disease until her metal levels are significantly lowered because metals act as conduits for infections. I can’t explain it well but I think it has something to do with this process they recently uncovered regarding manganese and Lyme disease. I suggest to include hot dry saunas that induce significant sweating. I was a weldor for many years, quit and went to college. There was access to a sauna in one of the gyms, and I began to use it regularly. Early on, I most certainly noticed, and a couple others noticed, that I smelled strongly of metal, more specificcally, I knew this to be nickel/chrome. When you weld stainless steel, the nickel/chrome smell/fume is normally noticiable. after a couple months, the metallic smell in my sweat went away. There is no implie connection with any other medical condition, because there were/have been none to associate. Umm, any thoughts about the size of the networks for these people prior to the ACA? Lambert, I’m sorry about what happened to your mother. We are all colored by life experiences so my view is just another way of looking at things. After having been poisoned by over treatment I find myself liking this system because it does exactly what you are saying it does. It limits access to specialists in neurology, cardiology and oncology. These are the three most egregious medical specialties in my opinion as far as patient harm goes and only treating symptoms. In my case I went to a neurologist and without even knowing what was making me sick he wanted to inject my neck with Botox (the muscle had become so tight in my neck it was causing massive headaches on my right side). And neurologists have the least answers of any medical specialty as to what is causing disease. Oncology is almost as bad (see the Cut, Poison, Burn documentary film). Neurologists don’t know what causes MS, scleroderma autism, FM, CFIDS, Alzheimer’s, ALS and many, many more diseases that are primarily caused by environmental toxins. In my case I have developed five diseases from gadolinium based contrasting agents (GBCAs). Two are because gadolinium, a toxic metal, which I was injected with 12 times, infiltrated my hypothalamus. But we must not talk about how our medical industrial complex is poisoning us now should we? That’s not politically correct. We should only talk about limiting care even if that is by and large a better outcome. I remember how this idea came to me. If I hadn’t jumped through the hoops my insurance company put me through to get MRIs with gadolinium based contrasting agents, I wouldn’t be sick today. They cause a new man-made disease called nephrogenic systemic fibrosis but the name of the disease should be gadolinium-induced systemic fibrosis. Now you must be asking what was wrong with you to have so many MRIs. That must be the cause and not the GBCAs. Well the reason is I am high risk, like Angelina Jolie, for breast cancer and carry a BRCA mutation. And I allowed myself to be fear mongered into getting these exams I didn’t need (thermography and diagnosis by proteomics are much better choices in my opinion). The only way I will get well, if it is even possible, is through chelation. Of course the medical industrial complex has a problem with that because chelation cures. And this is why cardiology is a joke too. http://www.forbes.com/sites/harlankrumholz/2013/03/27/chelation-therapy-what-to-do-with-inconvenient-evidence/. In the article regarding the chelation study, the therapy showed a significant improvement over the control group (all in the study had heart problems) in heart events of all kinds. But they don’t even mention why it might work. Perhaps getting heavy toxic metals out of your system is actually a good idea for your heart too. The ACA in many ways is exactly what we need. I’m tired of science being suppressed to enhance the profits of pharmaceutical companies aren’t you? Actually, I (Lambert) am the cross-poster, not the poster. So not my mother. That said, suppose a policy of reducing access to care is, in fact, a good thing, as I read you to say. Do you regard is as ethical to impose that policy on a subset of the population, based on their income? If so, why? If not, do you support the ACA, or do you believe it should be replaced? Lambert, I did notice that it was cross posted so sorry about that my misstatement. As far as your questions; yes for now I believe in the ACA because at this time it is needed to reel in 1) the mass poisoning of the patient population and 2)to promote safer, non-invasive methods of treating diseases and diagnostics. These are my opinions but I also worked as a federal auditor for DHHS/OIG and have been poisoned by GE’s product Omniscan which they are still injecting into people even though an early study showed that 25% of the toxic metal gadolinium is retained. Millions have been injected with it and many don’t know why they are sick. It took me ten years to figure it out. People are too trusting (brainwashed) and put doctors on a pedestal. We need to get our critical skills back in analyzing our health needs. In order to do that people need to be made aware. Until we take our collective heads out of the sand and understand the predatory nature of our healthcare system a single payer system is bad again my opinion. As far as some not having access to specialists well IMO that is a good thing, they, by and large have very little to offer in the way of health. Please watch Cut, Poison Burn and you will have a better understanding of where I’m coming from and it’s a good documentary. Were you aware that in many countries with single payer systems, UK and France that I’m familiar with, there is optional secondary private insurance for those who purchase it. It allows one to see private providers instead of the national plan providers. Of course if one is a very special person in pretty much any country, one can fly in to Cleveland or Rochester and pay cash, or oil, or gold, or whatever currency and go way out of network. Medical care will never be equitable, here or anywhere. That being said, my first choice is an educated and empowered consumer, as they will get with the best care in any system. The solutions can be straight forward for they entail utilizing the same methods of cost containment already so successfully used by the single-payer countries that provide better health care to their citizens. Give Affordable Health Care a Fair test over two years. 8.8m tried to register the first day. 800,000 youths are now covered by parents private insurance policy. Eliminate free care via emergency rooms. Low income consumers will receive tax subsidies to help cover the premiums. Anyone interested in the subject and even vaguely literate can find out what you just listed and that’s only the tip of the iceberg. The interesting fact is that the vast majority of the American people don’t know what you just wrote–they have no clue. Why? Two reasons: 1) both political parties and the mainstream media don’t want you to know these facts or any facts about the issue; and 2) the vast majority don’t want to know the facts or any facts about any controversial issue. Most people live in a world of TOTAL illusion about this country and the rest of the world. That’s why the corporate oligarchs can get away with, basically, any crime they want to get away with. If you want reform you have to deal with this issue–the actual issue at hand is irrelevant compared to the issue I just cited. We are way more than 800,000 twenty somethings at this point. Be careful about even bringing up eliminating free/cheap care in emergency rooms. I am sure that is coming and that will kill and bankrupt people. This “narrow networks” model, from what I can tell, and it is remarkably difficult to get info, means you will be limited to your network. Go outside, and in a lot of plans (it may be most/all bronze, and this may extend into the higher tier plans), you don’t pay an “out of network” premium (say a 40% copay v. 20% in network). Your medical care is not covered at all. Obamacare is just another plan in the “have old/poor people die faster” plan. Are you sure about the out-of-state coverage? If that’s the case then Obamacare is a complete fraud and we should be joining the Tea Party in opposing it–that would be a deal breaker for me. I did a search and couldn’t find anything can you direct me to where I can find information. Banger, When you are having a medical emergency outside of the place where you live, you really aren’t in a position to tell the ambulance team where to take you. In fact, it may not be possible for you to speak at all. The ambulance is going to transfer you to the nearest hospital. That hospital may or may not be in plan for you. As the network pool narrows, most likely, it will not be in your plan. Thus you will incur the penalty. I’ve actually seen this happen. This isn’t true. If you are out of state and thus out of network and require emergency care, your insurance must cover it. The only exception is if you travel abroad. And the plans showed in the screenshot had 50% coverage for out-of-network providers vs. 80% coverage, but there were higher deductibles and out-of-pocket caps too, IIRC. It’s been a long time since I’ve had insurance coverage that didn’t have in-network and out-of-network providers. It’s standard with Medicare Advantage plans, but even was part of the PPO and HMO plans offered by huge employers like AIG and Fortis, and single option coverage by smaller employers. Usually, the networks were pretty comprehensive but I recall with Fortis being limited to which hospitals were covered, e.g. the University hospital, level 1 trauma, was out-of-network. If the ambulance took one there though as most appropriate facility due to injuries, I suspect a denial could be successfully argued though. Once stabilized however a transfer would be arranged by the insurer. I have always successfully argued and won approval for out-or-network treatment at in-network rates if unable to obtain similar treatment at an in-network provider. If one ever feels they have been unfairly denied treatment by their insurer, the state insurance commissioner is an excellent resource. Unlike captured agencies like the OCC and SEC, insurance companies DO have a healthy respect for the state insurance commissions. They require that companies follow state laws and comply with their policies (read it! Few people do and it spells out exactly what is covered and what isn’t) if they want to sell insurance within the state. All the plans offered by New York State do not allow you to go “out of network” for healthcare. In other words, you have to use a doctor in each private insurer’s list, or they don’t pay a cent of reimbursement. But — Catch-22 — there’s no way to find out whether your doctor, or your local hospital, or clinic — is on the list because the site’s primitive search function is “disabled” “due to overwhelming response.” Call me underwhelmed. As jrs says below, and others have said, many of the plans on the exchanges are basically HMOs, NOT PPOs. Since the plans are offered state by state, and in some states (Vermont, for instance) there are insurers that aren’t national offering plans, query how they don’t have a de facto geographic restriction? I may have overstated in suggesting that some bronze plans may be only state-specific, but you basically can’t see what is in the networks on many (all?) of the exchanges now. And it appears you are now have a plan in a state where you have the right of external appeal (to the state insurance commissioner). New York works that way. A lot of states DON’T have that. You can appeal only to a higher level within your insurance company. I’ve read umpteen stories of people needing/wanting special treatments, being denied by their insurer, and trying to enlist their state insurance regulator, and the regulator has politely said they lack the authority. Traditional HMOs which limit your routine care only to HMO practitioners are required to cover emergency care out of HMO. But that’s under legislation from 1973. I haven’t seen any explanation of how the narrow networks under ACA meshes with emergency care. You can’t rely on the old normal with Obamacare, and Medicare is not the same. If you can cite language from the ACA, I’d be more comfortable. The site says this is the law under health reform. I don’t know if this is a change from pre-Obamacare though. Or perhaps it was part of requirements by states. Care must be covered for when people travel or it’s useless. It wouldn’t even qualify for catastrophic coverage. Under the health reform law, insurers have to pay for an ER visit even if the hospital is not in your plan’s network. (Again, grandfathered plans are exempt.) And they can’t charge you higher co-pays (the flat rate for a medical visit) or co-insurance (the percentage of a visit’s cost) for the visit either. However, a doctor who doesn’t have a contract with your insurance company might engage in balance billing, hitting you up for any charges that aren’t paid by your insurer. Some states, including California, have banned balance billing. If you receive bills for out-of-network ER services, consult with your state’s department of insurance to learn about the laws where you live Under the health reform law, insurers have to pay for an ER visit even if the hospital is not in your plan’s network. (Again, grandfathered plans are exempt.) And they can’t charge you higher co-pays (the flat rate for a medical visit) or co-insurance (the percentage of a visit’s cost) for the visit either. However, a doctor who doesn’t have a contract with your insurance company might engage in balance billing, hitting you up for any charges that aren’t paid by your insurer. Some states, including California, have banned balance billing. If you receive bills for out-of-network ER services, consult with your state’s department of insurance to learn about the laws where you live. So this seems less alarming that I had thought, but not necessarily as buttoned down as you suggested. So, what it’s saying is that the ER is covered. Many ER’s are staffed by independent practices. If they don’t like the amount they get from your insurer, they might bill for the difference, for physician services. Whether or not this is allowed depends upon the state where you live. It’s been many years but I was subjected to balance billing at an in-network hospital for a radiologist reading when I visited the ER. I disputed and believe won the claim however, as I prevailed in almost all disputes (as the denials were rarely legit). I’ve disputed LOTS and LOTS of claims, having had 6 figures of bills one year, LOTS and LOTS of denials, and being immobilized (and bored) for months. I learned to never accept a denial at face value. It’s one of many tactics used to avoid paying. Insurers also seem to be in need of the NSA’s services to track correspondence coming into their system. I researched this for NY. (1) You can find out who’s in-network for each company from the specific health insurance company websites — or by phoning them, which I did. (2) The ACA requires that all emergency care be paid for on an in-network basis, whether it’s in-network or not. Period. This is one of the actually good changes. (3) Yes, all New York State individual-market plans have abolished out-of-network coverage; this appears to be an insurance cartel thing and is not required by any law. Oh, also worth noting: my local Blue Cross Blue Shield affiliate (Excellus) stated that any doctor or hospital who was in-network for *any* Blue Cross Blue Shield affiliate, *nationwide*, would now be considered in-network for them. So there’s one place where the insurer is claiming that their network is getting *larger*. FWIW, it’s very important to check the appeal timeline rules in NY. Apparently in NY pretty much all appeals are successful *unless they’re time-barred*. The whole concern about the out of state thing is one reason why I went with the PPO and not the HMO plan through work. Because the HMO did not seem to cover out of network at all and it’s network was ONLY in state. Also I was afraid in a case of hospitalization, that not everyone who works at a hospital is necessarily in network even if the hospital is. Maybe someone taking the xray or something might not be in network and wham. Pretty much noone can afford major medical care if we have to pay it out of pocket. This is one of the lucky priviledged people with employer provided health insurance right. Now I’m paying $300 a month of my own money in premium despite having employer provided insurance because the employer part only covers part of the premiums, my deductables are a few 1000 (though things like doctor visits are covered before then), and I’m relatively young and not even sick, and have no preexistings. If the healthcare system isn’t even work for me … uh who does it work for? Plus of course the cost goes up heavily every year, so eventually instead of just making a bitter decision to put way too much money into health insurance, eventually I’m going to be forced into the HMO as well. And then if I ever get sick out of state, just let me die I guess. And this is with employer provided. Well, something had to give, didn’t it? In any case, one state exchange I was able to get into and poke around, CT (where my nominal address is), you see the same thing, though I haven’t actually graphed it this well. The exchange plans are definitely restricting access where non-exchange plans don’t. The insurance companies and the insurance regulators, both state and federal, faced a choice in setting up the exchanges with all the new mandates, and pretty much the only way to hold down the costs to a level that might have snowball’s chance in Hell of not falling into a death spiral of adverse selection was to put people in queues or to make care so problematic to obtain that people would voluntarily forego it. And, based on the pricing data, even this is unlikely to work. d) insurers are controlled and are not allowed to make money from the ‘basic package’ but only with add-ons : private hospital room, ‘private’ care in private clinics, elective surgery up to a point, psychotherapy beyond a low limit, alternative medecine, spa, rest-home type treatments, off the list medications, etc. etc. – a huge variety of contracts are on offer. The insurers have tried in several ways to render HMO type care the general model. In an HMO model, of course, the med staff is dependent on the insurer and slowly becomes part of a financial circuit which he or she – like the patient – cannot escape. The Swiss have voted against this model (presented in various ways) several times. At present, inscribing in an HMO care model -very few are available- affords a reduction of health insurance payments. (The strategy is obvious.) Another official option for reducing the health insurance cost is to give up the possibility of being able to consult a specialist (allergist, oncologist, dermatologist, heart surgeon, etc.) of one’s own bat, and only doing so with a chit for one’s primary care-taker, the local GP. Several delegations sent by Obama came to Switz. to study this model. Obviously the Switz. private health insurance scheme – note, I am not arguing for! – is very different from Obamacare. There is no penalty for not being insured. If sick and caught one is insured automatically, then either one has to pay or the State does. Subsidies for health insurance are not part of health insurance schemes / laws, but fall to social aid for individuals and families, just as the cost of housing, food, child care, transport does (means tested.) For sick ppl, back dated insurance coverage is the norm. As employers pay nothing for health care they have no skin in this game and proceed regardless of this issue. This is of course the one of the big plus point, both for employers and workers and the ‘economy’ as a whole. A geek who is sero-positive (AIDS) can apply for a job and get it, say. Nobody would dream of staying in a job because of ‘benefits’, hanging on. Now, models of health care / insurance are various, one shoe does not fit all, cultures differ, there is no ultimate ‘best practice’ to be put forward. See for ex. Japan, South Africa. something loading on this page is making my browser restart repeatedly. I’m sorry you are having trouble. However, hen you have a problem like that, you need to offer more detail. The required minimum for ANY IT issue includes your operating system and the browser you are using, including the version #. I can’t replicate your problem so it looks to be specific to your type of set-up. Deleting your cookies and closing and reopening your browser often resolves problems like that. if no one else is experiencing that, you are probably right. i’m stuck in IExplorer hell (10), due to its easier (not better) compatibility with my various school websites. it only occurs on this one page. all others at NC are just fine. The easiest cure is to move to another browser (ANY other browser). IE has been notoriously broken in every release, each time in a new and different way. All browsers have their individual peculiarities, but there’s no reason to pick the most peculiar when others remain free to download and install. I agree with you. yet all the different school course materials (their email is on one system, their course guides on another, and textbooks via publisher sites) and so on have at times failed to load properly when i’m using other browsers. 40 straight months of job creation. Stock market sets records. 20 million are out of the work force participation rate. Highest rate since 1979. Jobs created pay less with fewer benefits. Growing inequality and a declining middle class. Federal Reserve done part of it’s job quite well by keeping interest rates and inflation low. Will we ever see an economy where workers capture a fair share of the profits and get a fair minimum wage. Put an end to super CEO compensations that keep wages low and plunder the profits. Oh! How I miss the Clinton Decade. Unemployment As low as 3.9%. 22.4 Million good paying jobs created. Peace in America And UN handled Kosovo war. Help wanted signs everywhere. Hillary got Health Care Costs increases from 10% to 3%. The question I have with all the issues of multiple physicians treating a person, why not move to the mode where a specialist provides a consult and recommends to the Primary Care Physician what to do and what to look for, including those indications that mean the need for another consult. Combine this with requiring that outside of emergencies all prescriptions are issued by the PCP, so that interactions are caught early. It is not obvious to me why a specialist needs to be involved in monitoring a patient. I suspect this will be what the ACO’s will go to. Of course there is another name for a narrow network an HMO. It is clear that HMOs if done right reduce costs. I don’t know if studies have shown poorer care with HMOs. (Kaiser appears to be better care…, and I suspect they more to the specialist as a consultant in a lot of cases. Of course oncology is another matter, but cardiology is clear that this model could work. In any case all prescriptions should flow thru the medical home to avoid undiscovered interactions. A primary care physician is not going to want or be able to monitor even an orthopedic problem, and orthopedics is not all that complex a specialty. Ditto dermatology (checking if a minor in-office procedure like a cyst removal is healing properly, the derms’s nurses are better qualified to do that than a GP). Plus primary care physicians are already too scarce in our system. You are proposing to overload what is already the choke point.